The Evolution Steel Saw 2, now known as the EVOSAW380, differs in several way from a conventional abrasive chop saw. It offers the highest grade industrial metal cutting strength on the market today and utilizes a circular saw blade style, improving the cut quality, blade life, and safety factors in comparison to0 its competitors’ abrasive chop saws. Overall, Evolution saws are much quicker, safer, more accurate and economical than an abrasive saw. When cutting steel, using an EVOSAW380 ensures the material has a workable finish. Virtually no heat, burrs or sparks are created, unlike inherently dangerous abrasive saws. This saw can now handle up to a 15 inch diameter blade for even more capacity. Additionally, the Evolution 380 Raptor Chop Saw is designed to cut steel, aluminum and stainless steel without coolant. Since the material is cold, it can be handled and worked on immediately. This saw has a powerful 2200 watt 1300rpm motor, capable of coping with the heaviest of work. It has a maximum box cutting capacity of 4-3/4″ x 4-3/4″ and wall thickness of 1/4″. Blade life averages 800 cuts of 2″ x 2″ and wall thickness 1/8″ mild steel, which is ideal for cutting steel plate, square tube, angle iron, pipe, tube and metal roofing in a workshop environment. In comparison to an abrasive chop saw, the EVOSAW380 for steel has the typical alternating tooth design that is common for this kind of saw: One tooth cuts the middle of the kerf deeper, and then the next tooth widens the kerf. The saw spins slowly, and with more torque, shoving each tooth through the workpiece. This results in larger chips, instead of the white-hot metal dust commonly created by chop saws. The blade quickly glides through even heavy 1/4″-wall tubing with almost no pressure from your hand, and the cut off edges are immediately cool to the touch. Even when cutting off a narrow slice, the small piece that falls off is completely cool. 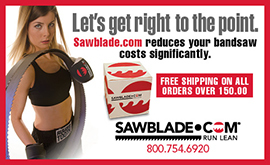 Go to sawblades.com to pickup your EVOSAW380 today, and for all your other saw blade needs.